Coach Matt Patricia couldn’t deliver a playoff berth in his first season with the Detroit Lions, but he gave his players the next best thing on Monday. It was Victory Monday without the victory in Allen Park, as the players didn’t have organized meetings the day before their regular day off Tuesday for Christmas. 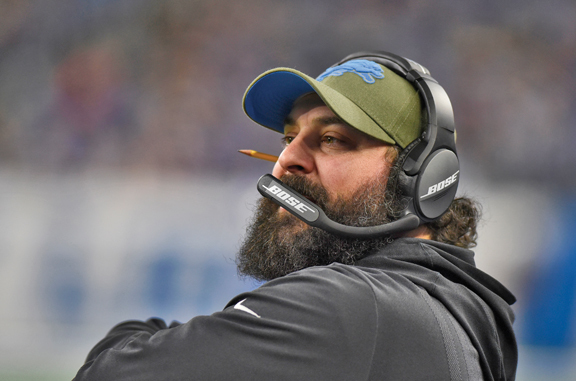 Patricia has had a rocky start to his tenure in Detroit, but Monday’s day off was another signal of his attempts to build rapport with players. It’s the latest sign of Patricia trying to gain the respect of his players despite a rocky rookie season. After Sunday’s 27-9 loss in the home finale against Minnesota, the Lions are 5-10 and clinched last place in the NFC North for the first time since 2012. Only draft positioning is on the line Sunday at Green Bay (6-8-1). The Lions are slotted at No. 5 in the draft order heading into the finale — not exactly what fans expected after former coach Jim Caldwell was fired after going 9-7 last season. Two of Caldwell’s four regular seasons as head coach ended with games against Green Bay that had playoff positioning on the line. As the long season winds down, linebacker Jarrad Davis said after Sunday’s game that Patricia had a personal message for him in the locker room. “He just told me to enjoy my family. It’s the Christmas season, we’re in the Christmas spirit,” Davis said. Patricia has often talked about how much he cares about his players, particularly when asked about injuries, which piled on his team this season at key spots.